If you’ve been priced out a San Francisco or Marin, and are tired of long commutes and gridlock, Sonoma County offers a great community with a high quality of life, and is also among the most affordable in the Bay Area. Check out the numbers or come visit and see for yourself. 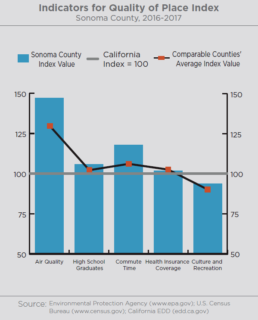 Sonoma County exhibited the second-lowest commute time among comparable counties, at an average of 24.5 minutes. This places Sonoma County behind only Monterey County. The number of individuals with health insurance coverage has seen an increase in recent years. Sonoma County ranked seventh among comparable counties with 93.2% of residents having health insurance coverage. 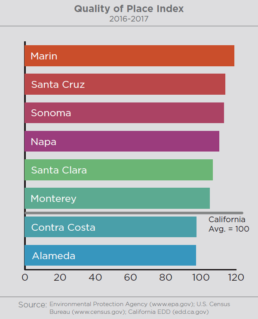 Sonoma County only had a higher percentage of citizens insured than Monterey County. The better educated the regional workforce, the more quickly an economy can take advantage of new opportunities and recover from negative shocks. Sonoma County ranked fifth among comparable counties, with 87% of residents holding at least a high school diploma. This is the percentage of days with air quality measured as ‘good’ by the Environmental Protection Agency. Sonoma County ranked equal to Santa Cruz County, with 97% of days measured rated as ‘good’ in 2016 for both counties. Employment in the Arts, Entertainment and Recreation sector(NAICS 71) per capita provides a measure of an area’s cultural and recreational opportunities. Sonoma County ranked fourth among comparable counties for culture and recreation with an index score of 94.